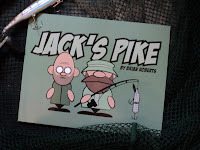 Jack's Pike Volume 1 is featured on the Bob Roberts Website (no relation). Thanks Bob! And I've just spotted it on his Mid-November Blog. Fantastic!